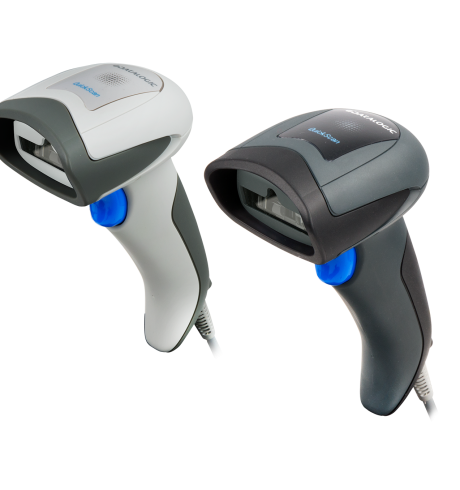 The Datalogic QuickScan QD2131 is an all-round barcode imager: its particularly wide field of view with the extra-long scan line ensures for the reliable capture of 1D barcodes, even from closer distances. You additionally benefit from the advantages of imaging technology. As a linear imager, the handheld scanner reads all 1D barcodes, as well as from printed labels, monitors and displays. Thus, the QD2131 is pre-destined for mobile marketing applications, such as couponing and special offers at the checkout. But that’s not all: the corded desktop model is also ideally suited for document capture in public administration offices and at utility companies. The housing of the QD2131 is impact-resistant up to 1.5 m and IP42-certified against the ingress of dust and liquids – important prerequisites for uninterrupted usage. A 5-year warranty secures the investment. The scan line is particularly bright and simplifies targeting; the patented »Green Spot« technology, as well as beeper and LED, confirm the successful capture. Thanks to the Host Download application you also perform Remote Management functions.